This is a common question that our hepatologists are asked at the Texas Liver Institute so we decided to answer it! The liver does not contain nerve fibers that sense pain. Therefore, liver tissue can be cut, burned, or develop significant scar tissue without any apparent sensation. 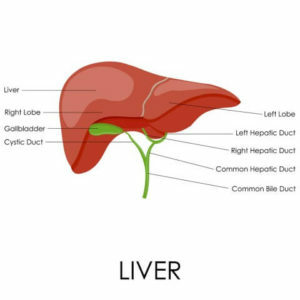 There are pain fibers, however, in the liver’s capsule, a thin layer of tissue that surrounds the liver. When this capsule is stretched from the growth of large tumors or those that are located at the edge of the liver, there can be pain. There can also be discomfort when the liver swells thereby stretching the capsule from severe hepatitis or fatty infiltration that can lead to an aching sensation in the right upper abdomen. Many conditions that cause chronic liver disease are also painless. One of the most common silent causes of liver disease is chronic hepatitis C infection which can remain dormant for 30+ years. For this reason, there is a general recommendation for all individuals born between 1945 and 1965 to undergo screening for Hepatitis C antibody as well as for all individuals who have increased risk factors. This antibody test is NOT part of routine lab work. When liver disease or inflammation is advanced, signs and symptoms may develop. Fatigue and nausea/loss of appetite are common however vague in nature. More specific signs include jaundice or icterus (yellowing of skin or eyes), swelling of legs or abdomen, dark urine, itching, confusion or easy bleeding (nose, gastrointestinal tract, or bruising).